College and university administrators consider personal attention to be the most critical factor in retaining at risk students. But what role should technology play in the effort? While many consider technology-based interventions important to student retention, few seem to be using such solutions, and only 2 percent have any kind of early warning system in place to identify at risk students, according to data released to Campus Technology by higher education strategy firm EducationDynamics. The information is an extension of data released last week as part of EducationDynamics' student retention survey to mark the company's inaugural National Dialog on Student Retention Conference, which will be held in June in Atlanta. The survey included responses from 357 respondents from 46 states and the District of Columbia (and one each from Canada and Guam). It was conducted in February and March. Among the findings, respondents rated in person meetings and one on one phone calls as the two most "effective" means for engaging students at risk. Respondents were asked to rate the effectiveness of various programs on a scale of one to five, with five being the most effective. In person meetings rated a 4.5, and one on one phone calls rated a 4.0. Social networking and e-mail came in third and fourth, with mean scores of 3.3 and 3.1, respectively. SMS/Text messaging rounded out the top five at 2.6. The bottom three were Pre-recorded MP3 files (2.0), postal mail (2.2), and voicemail (2.5). "These telling survey results will help educators and administrators focus on helping students identify obstacles early on," said Mark Shay, chief academic liaison at EducationDynamics, in a statement released to coincide with the survey. "It will also aid institutions in formulating concrete steps to help students overcome those obstacles and earn their degrees." 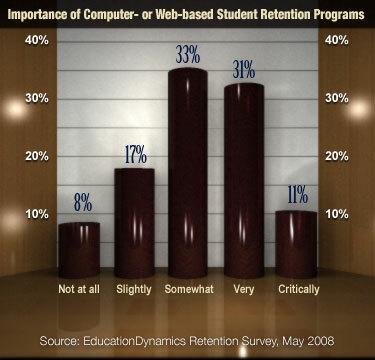 When asked about the importance of computer- or Web-based programs aimed at reducing attrition and improving retention, most (64 percent) said such programs were "somewhat" or "very" important. However, only a little more than half reported offering online advising services, and far less than half reported using online social networking, online career counseling, or online mentoring. Furthermore, few seem to be equipped to offer a wide range of online classes for those who can't attend classes on campus. 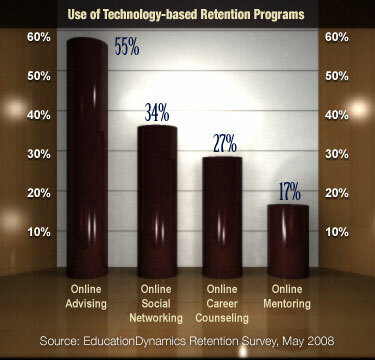 Eighty-two percent of respondents said that 25 percent of less of their classes are online. Twelve percent said they offer 26 percent to 50 percent of their classes online. Two percent said they offer 51 percent to 75 percent of their classes online. And 4 percent said they offer 76 percent to 100 percent of their classes online. Of those surveyed, 63 percent said they do "project retention and graduation rates and report on progress toward that target." Of those participating in the survey, according to EducationDynamics, 69 percent had less than 20 percent of their student body enrolled in graduate programs; 51 percent said that more than 70 percent of their student bodies are made up of undergraduates. Seventy-seven percent had enrollment of 10,000 or fewer students, and 46 percent had fewer than 3,000. Seventy-six percent said that "more than half their students depend on federal financial aid to pay for school." The complete results of the study will be released at the National Dialog on Student Retention Conference June 3. Further information about the conference can be found here.